Let’s kick off the week with a tribute to one of the coolest places in Charleston. 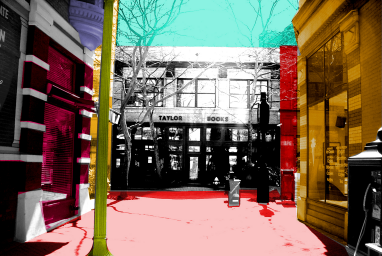 Here’s a shot of Taylor Books, taken from the Brawley Walkway and digitally-assaulted in my trademark manner. Enjoy! Once again, click the photo for a larger view. And go here for the Monday Morning Art Store, and here for the PopCult store. Vote with your dollars! Is “Pop Art Charleston” a bold new direction, a cheesy way to recycle old works into T-Shirts, or am I just in a rut? What a week for our friends in The Concept! Six months after they first appeared on Radio Free Charleston, they scored a local PR trifecta, being featured in articles in the newest issue of Graffiti, as well as this week’s Gazz and even a video interview at Gazz TV. Of course, we knew them back when they were on episode seven and episode thirteen of Radio Free Charleston. They’re a great bunch of guys, and they deserve all the notice they get. Here’s their video for “Guitar Pick In My Kool Aid” from episode 13 or RFC. Congrats on a great week, guys. I hope we can still get you to come back on Radio Free Charleston after you’re all rich and famous. The 2nd Annual Collis P. Huntington Model Railroad Show takes place this weekend, April 27, 28, and 29 at The Dunbar Parks & Recreation Community Center at 2601 Fairlawn Ave. in Dunbar. There will be displays of model trains and railroad memorabilia, along with dealers selling trains, books, China, and all sorts of train related niftiness. In addition, there will be historical displays, and for the kids, Thomas The Tank Engine and Geo Trax set-ups. The show is presented by the Collis P. Huntington Model Railroad Club. If you go: The Dunbar Community Center is located at 2601 Fairlawn Ave. (Route 25), Dunbar. Show Hours are 5PM to 8 PM Friday, 10AM to 7PM Saturday, and 10AM to 4:30 PM on Sunday. Admission is $3.00 for adults, $2.00 for children under 12. For more information call (304) 523-0364. Brain Trauma is Charleston’s leading horrorcore rap group, and they’re making their new album, “Army Of Trauma Victimz” available as a free download from their website. This is a “Parental Advisory” album, due to strong language and dark themes, but it’s also a musically intriguing statement about the world and hip hop culture’s role in it. Plus, anyone who opens their album with samples of Charles Manson has pretty much won me over. I used to play cuts from his album on my old radio show and say he was a local boy. I met Kasket Kyle and Toxic Flow from Brain Trauma through IWA East Coast wrestling, and we’re going to have them on Radio Free Charleston very soon. Until then, download the album and check it out. Don’t crank it up at work, though. Might not be prudent. On this date in 1953, Winston Churchill was knighted by Queen Elizabeth of England. In honor of his knighthood, here’s a video of Alice Cooper on The Soupy Sales Show. Sadly, Sir Winston Churchill never appeared on The Soupy Sales Show. 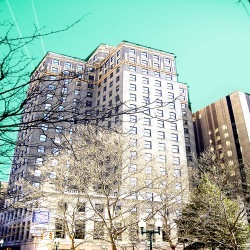 This morning we take a look at a digitally-assaulted photograph of the Sun Trust Building on the corner of Capitol and Lee Streets. This photo has been stretched, squashed, colorized, airbrushed and had the contrast tweaked. You can click the image to see a bigger version. And You can go here for the Monday Morning Art Store, and here for the PopCult store. You still have time to be the first customer! This week our cool thing is The West Virginia Hot Dog Blog, created by Stanton. 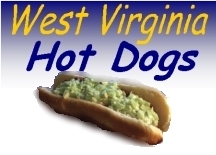 This blog, which probably gets more mainstream press than any other blog in the state (and deserves it) presents reviews of West Virginia hot dogs from all around the state and beyond. Recently, Stanton even added a Podcast to his already impressive site. You might think that the topic of West Virginia Hot Dogs would be limiting, but Stanton’s writing, as well as that of his cohorts Chris James and Kevin Smith is so passionate and clever that it draws you in. You actually want to find out how good the hot dogs are at some remote dairy bar in a county you never knew existed. They make you care about nitrates and goo, slapped on a bun. Shot and edited in a record less-than-24-hours, the latest episode of Radio Free Charleston is now online…ten days later. That doesn’t make it any less cool, though. This show is a departure in many ways. First, it’s a road trip show. Melanie Larch and I drove to Parkersburg and taped at John Radcliff’s house. John was hosting a Songpull event, where songwriters gather and perform tunes that they’ve penned within 30 days of that event. Visit the Songpull.com website to see and hear the results of these songwriting exercises held all around the country. Later this week the Parkersburg Songpull tunes should be online. We’ll post an update when they are. Aside from the brand-spankin’ new Songpull tunes, we managed to finagle some older songs out of the participants, and that’s what you get to hear on the new RFC. We have great songs from brothers Don and Daron Baker. DonBaker is from Belpre Ohio. His brother Daron is from Columbus, and performs with the band Rustic Bucket. Each Baker boy gives us a terrific song. We’ll have more from them on future episodes of RFC, and special apologies to Daron, whose name we mis-spell throughout the show. Them’s the hazards of editing a show in 24 hours. John Radcliff sets a record by being the first musical act to appear on three consecutive episodes of RFC! This wasn’t the original plan, but it worked out pretty great. 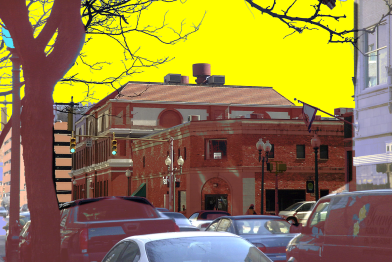 This week we gaze Northward on Capitol Street from the vantage point of Davis Square. In the middle of the picture you can see the Fed Ex Kinko’s, which stands on the very spot where the Xerox room was when the State Capitol building was on Capitol street. This building was spared when the Capitol Building was destroyed by Guy Fawkes so that Mama Cass Elliot could build the new Capitol that we all know and love today. Or at least that’s the way I remember it after having food poisoning all weekend. As always, click the photo for a larger view. And go here for the Monday Morning Art Store, and here for the PopCult store. You still have time to be the first customer! 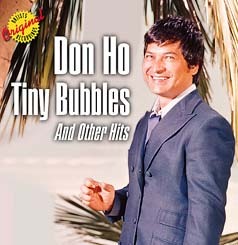 Isn’t it especially sad that legendary Hawaiian novelty singer Don Ho passed away in a week that saw his name in the news more than any other time in history? Cheesy entertainment in our fiftieth state will never be the same. Hoist a tiki cup in his memory, folks.